At tractorpool, we already have various protection measures in place to ensure your digital security in our market presence. To protect you against phishing websites, we have also developed the tractorpool browser extension. Download our tractorpool security extension for your browser to protect you against phishing sites that we know of. A red tractor symbol warns you of a phishing website; if the tractor shines green, you are on a safe, original tractorpool site. You can find the extension for the browser Google Chrome here. Mozilla Firefox users can find what they’re looking for here. 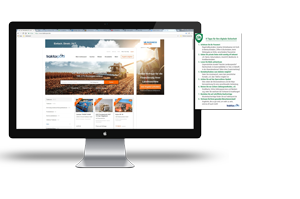 Tractorpool provides you with somewhere for you as a dealer to meet with prospective buyers, establish contacts and enter purchase agreements. For your digital security and protection of your private data, we have extended our market to a highly secure trading platform. At tractorpool, we offer you an environment for you to trustingly deal in second hand vehicles. To enable us to further enhance your digital security and protect your personal data even better, we require your support. Use these 8 tips to play safe! hand corner next to the browser address. У вас є запитання чи пропозиції? Не вагайтеся зв’язатися з нами! Натисніть тут, щоб перейти до контактної форми.